Appealing to the desires of a variety of holiday makers, Aqua on Reed is as purposeful as it is beautiful. Equally suited to large families, couple's seeking a romantic retreat or a group of friends just catching up. 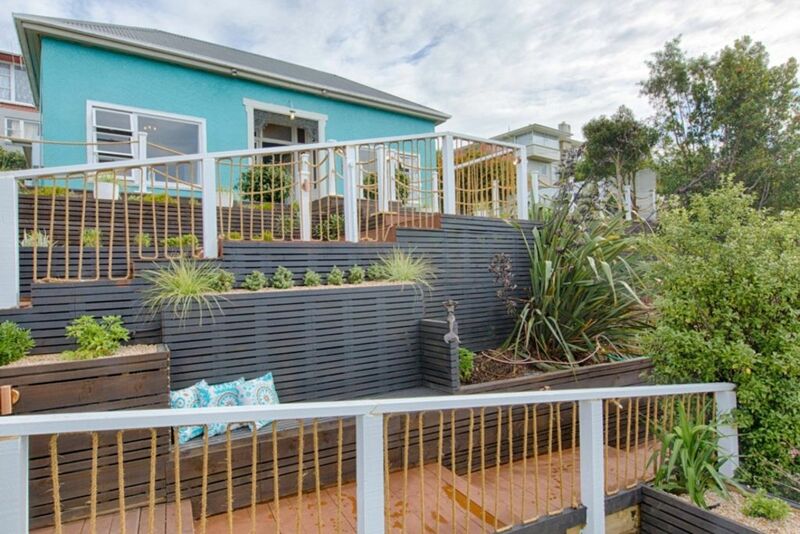 Well-appointed and charming, space is utilised wisely and indoor living areas flow naturally into relaxed outdoor living; featuring sprawling decks and sensational views of the Oamaru township and Pacific Ocean. Aqua on Reed evokes a casual seaside elegance and offers a very pleasant holiday stay. Two generously sized bedrooms accommodate queen beds and offer fabulous views of the sea and native garden. The third bedroom overlooks the deck and patio area and provides a fabulous hang out for the kids with two single beds, 40 inch LCD TV, DVD player and Xbox 360 complete with a great selection of games and DVDs. All rooms are dressed for ultimate guest comfort and are fitted with quality linen. In the cooler months the house is kept warm and cosy with two large heat pumps offering reverse cycle heating/air-conditioning.Dine outdoors with large Family Gas BBQ or prepare a feast in the modern spacious kitchen where you will find absolutely everything you need. Relax around the 60 inch television in the modern comfortable lounge to watch your favourite sporting team or movie. (Also complete with DVD player, Sky and Surround Sound). Situated in central Oamaru, easy walking distance to restaurants, cafes, shops, Victorian Precinct and Oamaru Gardens; Aqua on Reed provides the ideal home base to explore the many fabulous attributes of the Otago region. Oamaru itself is a fantastic holiday destination and it truly is an unexploited gem; but don't take my word for it; book into Aqua on Reed today and experience all that this great region has to offer. The location of house is convenient and on the board before the door we can watch the sea. Great house. A delight to stay in. Warm and with everything you could want for an enjoyable stay. The property is very striking and easily identifiable from a distance. The property is very striking and easily identifiable from a distance. It is located on a hill overlooking the ocean on a quiet inland slope on a street running parallel to the main street. The business district and the Victorian section of town are within a fair walking distance of the property, but are accessible on foot in about 15-20 minutes walking time. The property is well maintained and well appointed. Location was ideal, close to town and easy parking. Location was ideal, close to town and easy parking. Property was incredible, warm, stylish and had everything you could think,of. What a delightful find! There was nothing missing from this property for our group of 3 couples. What a delightful find! There was nothing missing from this property for our group of 3 couples. The beds are extremely comfortable and the linen beautiful. There is one bathroom which we found worked fine with a party of six adults. The water pressure is excellent and the bathroom spacious. There is a communal kitchen/dining/living area at the rear of the house opening onto a spacious deck with lovely outdoor furniture and a bbq. Can definitely recommend this property to others. Thank you! Great spot overlooking the sea and close to town. Great spot overlooking the sea and close to town. Very well appointed and fitted out. Our second visit here. It has everything you need.